As if there aren’t enough reasons to apply into the GLL Sport Foundation for a training membership – but another one has been added to the list! 3 DAYS TO GO! 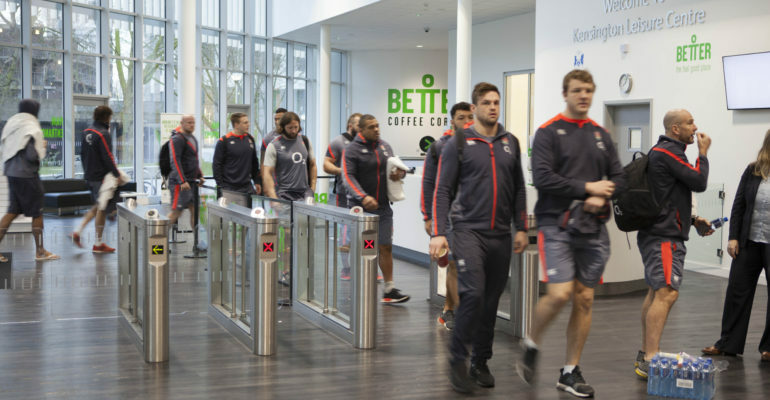 Kensington Leisure Centre on Silchester Road played host to the England Rugby Squad this week, as they ramped up training in the run up to their match against Italy on Sunday 26 February 2017. Players visited the leisure centre on Tuesday 14th February plunging straight into the 25m swimming pool for lengths and some active recovery work in the water. They returned to the poolside once again on Thursday 16 February when they undertook additional water-based training and enjoyed a game of water polo. England’s No. 8, Nathan Hughes handed the General Manager Oliver Stacey a signed England shirt on behalf of the team, as a thank you for the warm welcome the players had received when training at the centre. The new Kensington Leisure Centre, which was built by the Royal Borough at a cost of £30 million, was opened in March 2015 and is regarded as one of the finest sports centres in London. Oliver Stacey added: “It’s been fantastic to have the England players and coaching staff training at Kensington Leisure Centre this week. “The fact we are able accommodate one of the world’s best international rugby teams highlights the quality of the facilities. There are just 3 days left to apply into the GLL Sport Foundation – don’t delay! You could be training amongst some of the best athletes in the world!